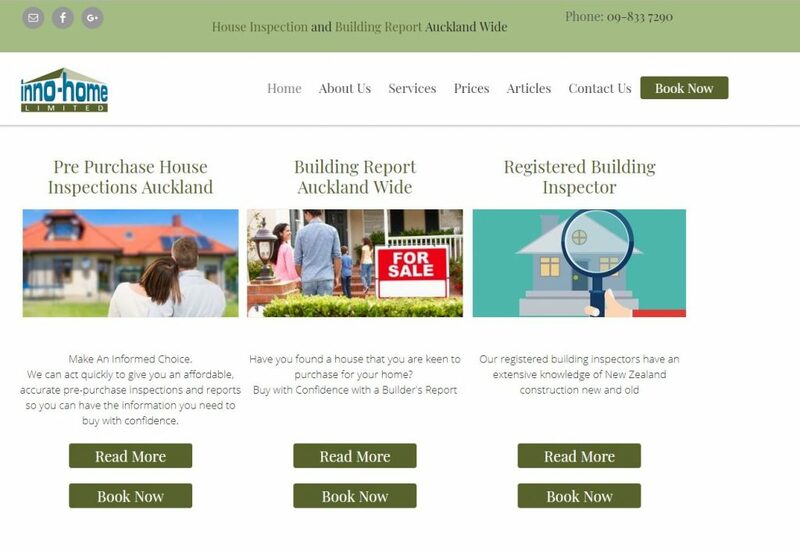 Innohome Inspections engaged us to help improve their volume of website visitors from organic search ie when searching on Google. There were paying Adwords each month and hoped to take a longer-term approach by investing in their website and social media. They took a Bronze SEO Plan. I worked with the owners to create an SEO strategy. content strategy for blogging and social media posting to facebook and google my business. “I would highly recommend Tarnya at Kitchen Table Web Design. 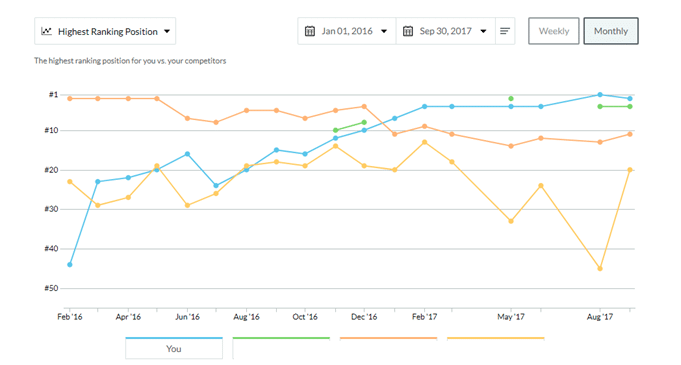 I have used two previous SEO companies and ended up getting poor results long-term as they only did back linking. Tarnya at Kitchen Table Web Design helped me rank almost first page in all my keywords in about two months time. In addition, her rates are very reasonable considering all you get. Thank you again for your work. We continue to see an increase our website visibility on google search. 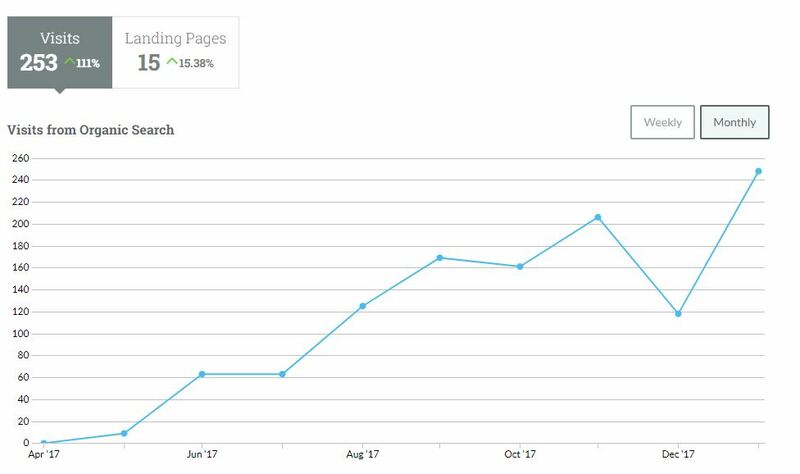 We have been able to reduce our Google Adwords costs and still achieve the same amount of jobs, especially the last two months, because people are finding us on google search. We are so pleased we invested in your services. The graph below shows a steady increase in traffic to the website. 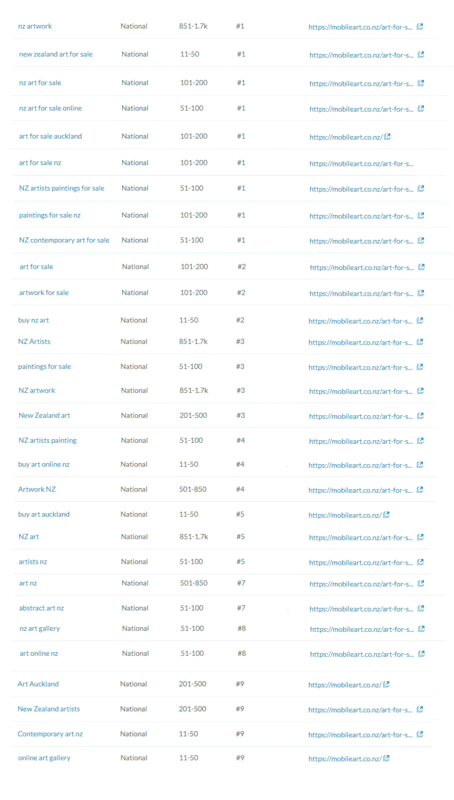 Not only was has the traffic increased but the website has a low bounce rate and the traffic converts to new customers. Mobile Art Gallery engaged us to help improve their website search ranking and volume of website visitors. I worked with the owners, Dennis and Judy to create an SEO strategy. They were highly motivated to work on their website and keen to understand how SEO works. Therefore I worked on an SEO approach that involved some services from me but also equipped them to improve their website’s ranking. The results speak for themselves. The following chart shows their keyword phrase ranking in October 2017. The 3rd column is the volume of search in New Zealand and the fourth column is their rank. I have listed the higher volume phrases that appear on the first page of google that we tracked. The graph below shows the ranking change over time (18 month period) for the keyword phrase “art for sale” on google.co.nz. Mobileart.co.nz is blue, the other colours are in competition. Search volumes 100-200 per month for this phrase. My wife and I engaged ‘Build Your Website’ for the purpose of building a new website for our existing business. Tarnya introduced us to the concept of search engine optimisation. As novices, we both benefited greatly from her tuition and support over these last two years. Tarnya’s personalised videos showing us how to perform individual tasks were particularly appreciated and very useful. We own an art gallery and recognise that SEO is not a silver bullet, but it is the next best thing to a marketing strategy that is cost effective and has a reach far greater than other traditional methods of marketing. Tarnya’s SEO input as regards website design, backlinks, use of keyword phrases and the one on one training she provided has helped us to markedly increase our visibility and develop our business in the right direction. Tarnya’s been a great help in our journey to Search Engine Optimisation.